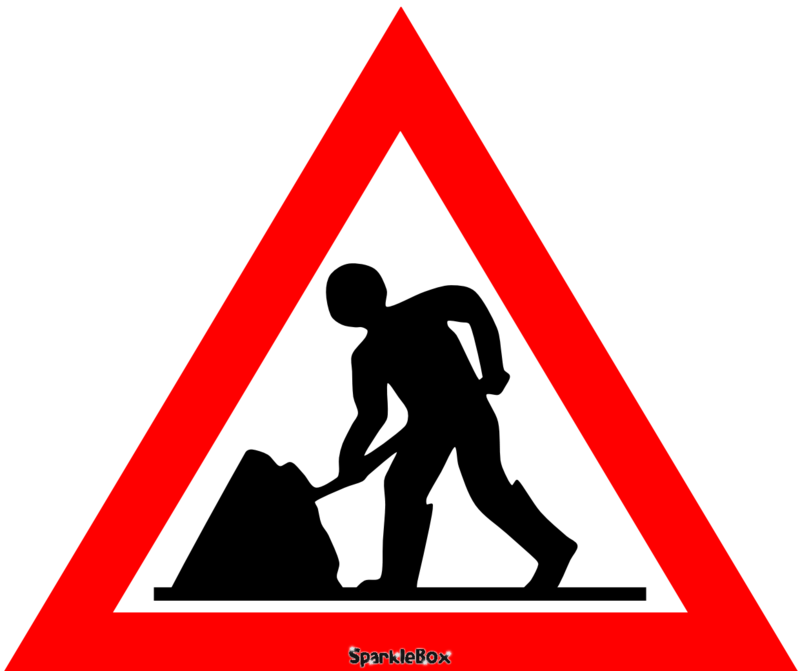 Work to install kerbing outside the church to commence on Monday December 3rd between the hours of 08.00 – 16.00 for up to 2 weeks. At the request of Horley Parish Council, Oxfordshire County Council have agreed to install a kerb along the east side of Church Lane, adjacent to the church boundary in order to protect the grass verge from further erosion. Conservation kerbs will be used to match those existing at the Hornton Lane/Church Lane junction. Work is programmed to start on 3 December, and may last for up to two weeks. The road will not be closed, but no parking will be permitted along the section affected during the working day. For more information see the Parish Council Notice Board. This entry was posted in Posts by Parish Council and tagged church lane, conservation kerbs, Horley Parish Council, kerbing on November 27, 2018 by thehorleyviews. Thames Water are to carry out some repairs to the water main on Hornton Lane, and will be closing the road between Lane Close and Church Lane. The works are scheduled to take place from 18.00 on the evening of November 18th and a road closure will be in force to enable the works to be carried out safely. 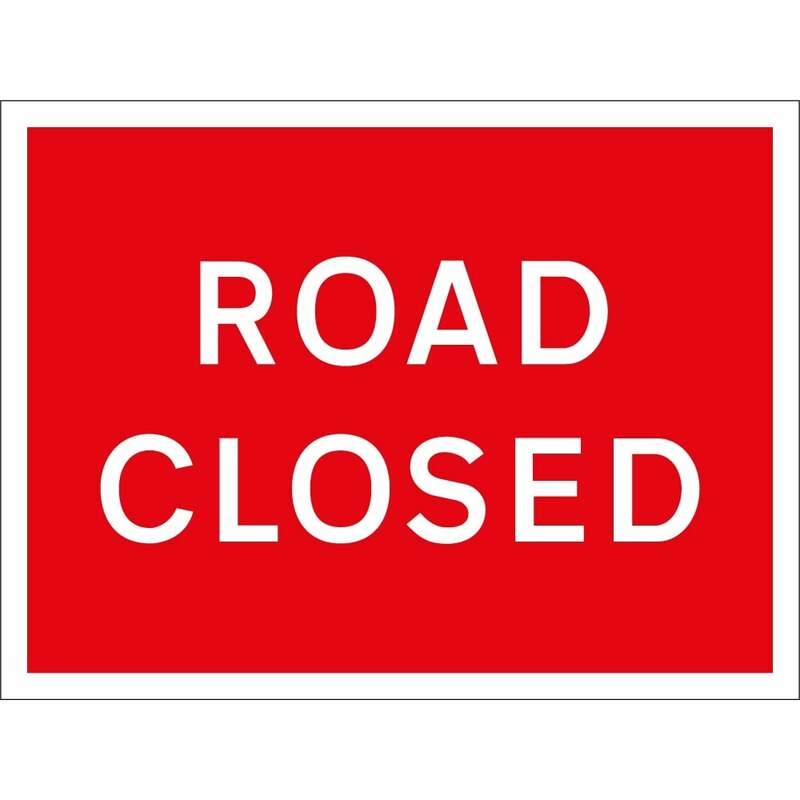 This entry was posted in Posts by Parish Council and tagged Hornton Lane, Road closure, Thames Water on November 12, 2018 by thehorleyviews. Would you like to be a Community Warden or a Local Highway Inspector For Horley? Oxfordshire County Council wish to attract volunteers to assist with two areas of work in their local communities. 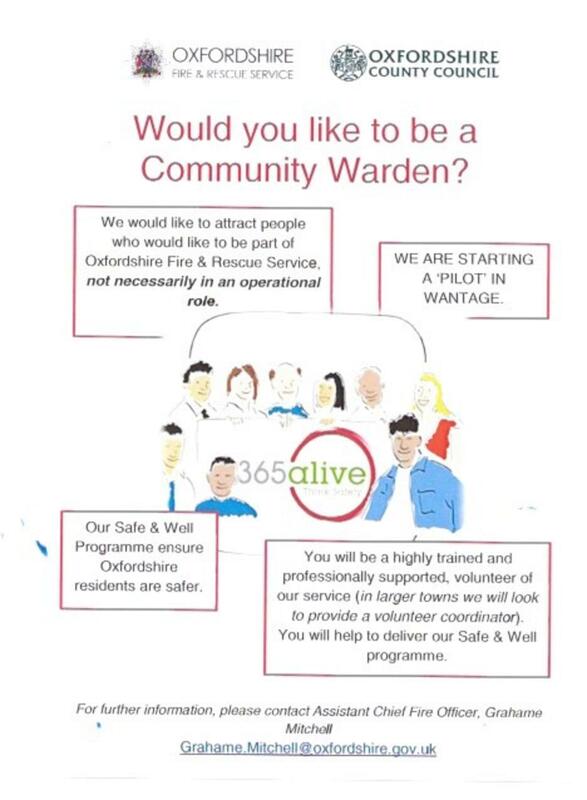 A Community Warden will aim to help elderly or vulnerable people in our communities, and generally anyone who needs assistance. There is a focus on fire safety, and ensuring people are able to get the appropriate help if things go wrong, such as in the event of severe weather, power cuts, or other emergencies. Appropriate training will be given. 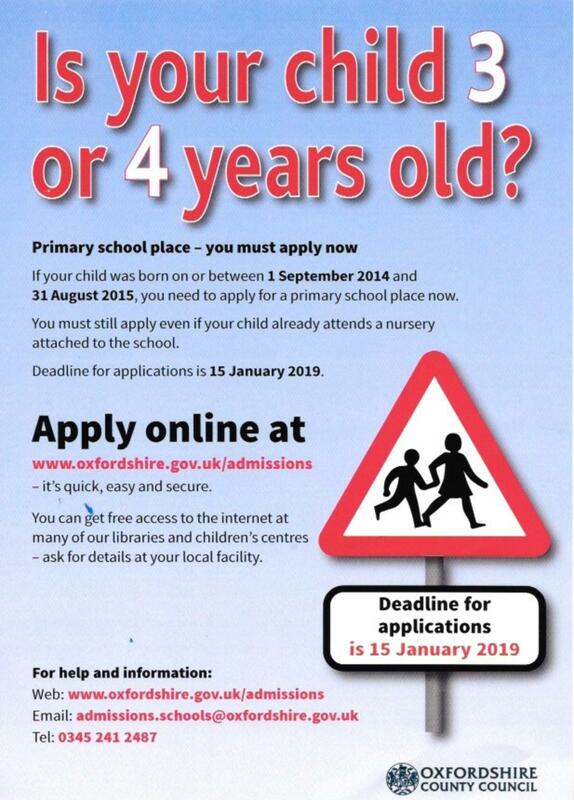 See Details below or contact grahame.mitchell@oxfordshire.gov.uk. A Local Highway Inspector will report problems arising such as potholes, so that repairs can be arranged speedily. Again, appropriate training will be provided. If anyone is interested in this role, contact the Parish Clerk, David Marriott, at horleyparishclerk@btinternet.com, or on 07872 930030, he will pass on their contact details to the County Council. This entry was posted in Posts by Parish Council and tagged Community Warden, Local Highway Inspector on November 3, 2018 by thehorleyviews. The next Parish Council Meeting will take place at 7.30 on Thursday October 11th in the Old School Room. The meeting is open to the public, and if anyone wishes to address the Council on any of the items on the agenda, please notify David Marriott on 0787 2930030 or email horleyparishclerk@btinternet.com before the meeting. Whilst there is no absolute right to do this, the Chairman has the authority to permit it if he chooses to do so. 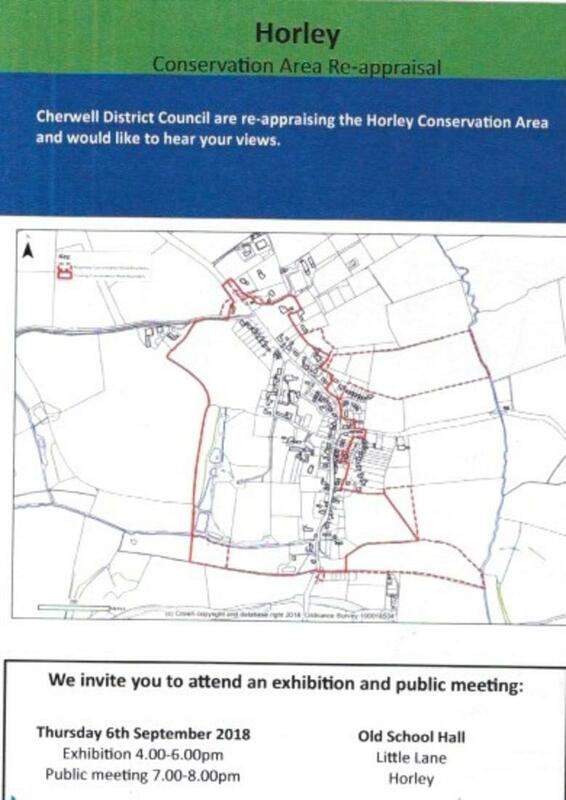 This entry was posted in Posts by Parish Council and tagged agenda, Horley Parish Council, The Old School on October 1, 2018 by thehorleyviews. From 6 September the appraisal will also be available on line here . Alternatively the document will be available in hard copy format at Bodicote House and at Banbury and Woodgreen libraries. The public consultation period on the draft appraisal will run from 6 September until 8 October. 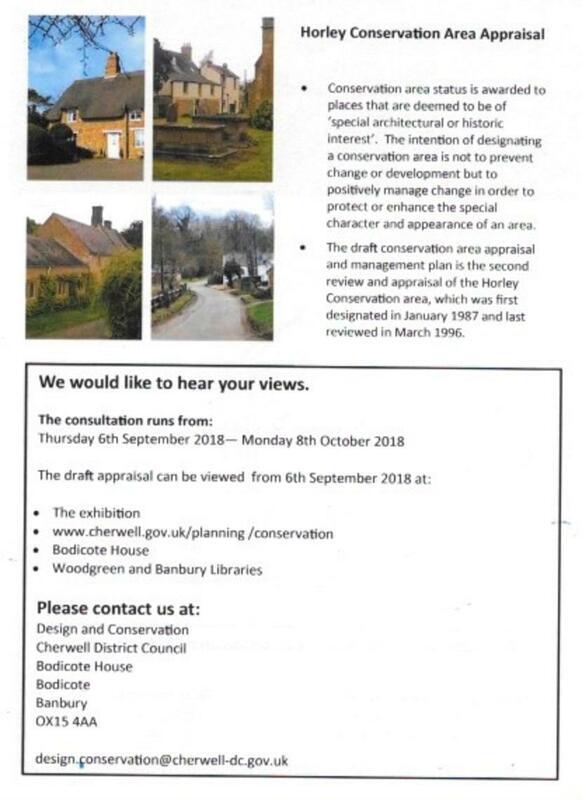 This entry was posted in Posts by Parish Council and tagged Cherwell District Council, conservation area appraisal on August 26, 2018 by thehorleyviews.